JOURNEY to the CENTER of a TREE by Shigo, A. L.
Come along and view the anatomy and life systems of this remarkable organism in a way you've never seen them before. to inhabit the earth? Dinosaurs are the largest land animals known to have existed. They approached the limit of what the earth's gravity would allow without crushing vital organs or collapsing under their own weight. Blue whales are even more immense, but are saved by the buoyancy of the environment in which they live, as is evident when beached whales are crushed by their own 150-ton bodies. But you don't have to go to a museum or on an ocean voyage to see the earth's most massive living things. Most people can see these organisms, though perhaps not the largest specimens, by simply gazing out their windows. Trees are so common that we often forget how extraordinary they really are. They live on all the continents except Antarctica and in an astonishing variety of environments, from tropical to subarctic, rainforest to desert fringe. The General Sherman Tree, the world's largest giant sequoia, weighs approximately 1,450 tons-as much as nine blue whales. If blue whales can't get away with their weight on land, how do trees do it? And with dinosaurs extinct and many species of whales endangered how have trees been able to survive and thrive? The answers lie within that tree out your window. As we journey to the center of that tree-or any tree-we'll find that the answers lie more specifically in the structural properties and growth processes of a tree. You'll also see that a better understanding of these can have practical applications, such as helping you prune your trees to their advantage and prevent unnecessary wounds. But a journey to the center of a tree will require you to visualize and think about trees in a way that you probably never have before. For example, do you see any similarities between a tree and an onion, or a stack of upside-down sno-cone cups? How about a submarine? Well, you will by the time you finish reading this article. Such analogies will be useful in helping you understand how trees stay healthy. Too often, we tend to empower trees with human qualities. The ability to heal after injury is a good example. Since a tree cannot "heal" in the sense that animals do, it must deal with injury and infection in another manner, which will be discussed in more detail later. First, we must learn about the structure of a tree. woody trunk is a variety of structures, each performing a number of functions. Trees are like onions in that they have many layers. The outside layer of a tree, its bark, surrounds the entire organism except for roots, leaves or, needles, and reproductive organs. At the risk of giving trees human characteristics, bark is similar to our skin, which covers everything except our hair and nails. Beneath the bark is the cambium, which is a cell factory that generates a new growth ring every year (or every growth period). As we pass the cambium on our way to the center of the tree, we find those growth rings of wood. The growth rings are divided into two kinds of wood-sapwood and heartwood. Sapwood has living cells and performs many vital functions for the tree. The cells of heartwood are a dead, but in healthy trees the heartwood is sound and contributes support and protection to the tree. The ratio of these two kinds of wood varies from species to species. Osage orange and locust have only a few rings of sapwood. American elms have between 12 and 18 rings no matter how old they are, signifying the 12 to 18 most recent years of tree growth. Birch and maple may have 40 to 100 and very little heartwood. At the very center of a tree is a pencil-thin rod of pith, which represents the stem that was the tree in its first year of life. Structurally, trees can be compared to a stack of conical paper cups. Each growing season, a new cone is added to the stack. If it were possible to remove all the inner layers and leave only the most recent growth ring, the tree would continue to stand and function normally with no noticeable differences to the observer. This is possible because growth in trees occurs close to the outside. The cambium, just under the bark, is the only area of the trunk where new cells are generated. Cells formed outward from the cambium develop into phloem (the food conducting tissue of a plant) and bark. Bark is divided into two layers-inner bark is comprised mostly of active living cells, and outer bark consists of a corky protective shield. 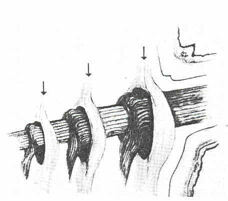 Cells formed inward from the cambium develop into xylem (water-conducting tissue), and comprise the bulk of a tree's wood. By a process called "cell differentiation," living cells (called parenchyma cells) develop into various tissue. Transport vessels in hardwoods (called tracheids in conifers) form within days or weeks when certain cells grow large so quickly that their contents break away from the walls, making the cells hollow. The end walls between these cells break down, creating small openings that form a conduit between cells. Food from the leaves moves down the tree in the phloem's transport tubes while water and dissolved minerals move up from the roots in the xylem's tubes. Respiration in the roots, an energy- "burning" process, requires food from leaves to be "pushed" downward with a pumping-like action. Finally, water is drawn upward, as in a straw, when transpiration and evaporation in the leaves "pull" fluids up like a siphon. Fibers, on the other hand, develop when adjacent cells do not lose their contents for months or even years. But as with the transport vessels, the cells themselves are dead. Fibers are primarily for mechanical support. They provide tensile strength in an up-and- down (axial) direction, while the rest of the trunk provides compression (side- to-side) strength. Functioning vessels occur only in sapwood. Most of the axial transport occurs in the current growth ring. Only a fraction of the previous year's transport system is used once new ones are formed. In some trees such as American elm, spring vessels form when the leaves emerge. As trees age, vessels clog and no longer transport fluids. Click here for "SHIGO'S JOURNEY". "Once a tree is injured, it invariably. . .carries the injury or infection for life. " Seventy to 90 percent of the bulk of sapwood is dead, although about 80 percent of the cells in the wood are alive. This is because the cells that become wood, vessels, and fibers are very large compared to the living parenchyma cells. The woody cells have thick walls containing lots of cellulose and lignin-rigid materials that give trees their strength. These cells are bound into a grid pattern, like bricks in a wall, that makes the tree strong. The living parenchyma cells, on the other hand, have thin walls. Parenchyma cells cluster into the rays, which are visible in the cross- section of many kinds of wood. Check the oak in your woodpile for these rays, and you'll see that they divide a cross-section of wood into very thin pie-shaped wedges. Liquids move radially (in and out) through rays via parenchyma cells and a chemical process not observed in any other living organism. Now that we know something about the anatomy of a tree, we can examine how it allows the tree to live and function. From their basic structures, trees have evolved protection and defense mechanisms. The difference between protection and defense is like the difference between a fortress and a battle. One is passive, and the other is active. For example, the outer bark not only provides physical protection, but it also contains a waxy material that water- proofs bark and gives it an antimicrobial power. Trees have also adapted their layered structure for protection. Trees can't "heal" after injury as animals do, because they don't have the ability to generate new cells to replace damaged and infected cells. Neither do trees have the immunological chemistry to fight disease or infection. Once a tree is injured, it invariably becomes infected with microbes or fungi and carries the injury or infection for life. But unlike animals, trees "compartmentalize," or wall off and isolate, infected areas to prevent disease from spreading to healthy areas. Isolating disease by compartmentalization is an adaptation of growth processes. Each year trees grow new leaves or needles, non-woody absorbing roots, flowers, and seeds. These organs are also shed annually. The cambium grows a thin corky layer of boundary cells that isolate these parts before they die. When any part of the tree is under attack from microbes or fungi, a similar process occurs. The cell-generating cambium layer can modify cell production much the way a queen bee does. When all is fine in the hive, the eggs become soldiers, workers, or drones. But when the hive is under attack, more eggs develop into soldiers. In a healthy tree, the bulk of cells in the cambium layer differentiates into xylem and phloem tissue-the tree's pipelines between the leaves and roots. But when a tree is under attack, cell differentiation changes its priority to the production of parenchyma cells, and it varies the chemical makeup of these cells as well. They produce a class of chemicals known as phenols, which discourage infection. With this change in growth pattern, the tree produces a strong barrier zone that can encircle the tree and prevent the spread of disease. This new type of wood is only part of the tree's reaction to trouble. Damaged areas are sealed off inside the barrier zone, too. The living parenchyma tissue that is woven between the xylem and phloem during periods of normal growth can deliver needed chemicals to the dead transport cells. Radial transport of these protective liquids clogs vessels, preventing the spread of pathogens upward and downward. The infected area is walled off the way damage can be sealed off in a leaky submarine-by simply closing one door to prevent the leak from spreading to other areas of the submarine. Evidence of struggle can be seen in wood. When a tree generates a lot of parenchyma cells to isolate infection, it uses energy that would otherwise be available for growth. The result you see is a thinner growth ring. In addition, compartmentalization discolors the wood. The more injuries a tree has sustained, the more its activities and internal structures are diverted to seal off infected areas. This leaves fewer cells and organs to maintain life and growth. Mature trees contain hundreds, perhaps even thousands, of these compartments. It is the compartmenting process that saves trees, but like all good things, it is possible to have too much. Compartments can stop the movement of disease, but when they become too numerous, they can also stop the movement of the tree's vital fluids. That's how the natural death of a tree occurs. injure trees. To these can be added other natural agents such as birds, insects, and animals. And finally, there are people. You may have heard that trees "like to be pruned." Pruning can improve the quantity and quality of fruit and nuts as well as board-footage. And like a haircut, pruning can improve the appearance of a tree. But it is important to distinguish between what is in the interest of the tree and what pleases humans. Pruning is a trauma to a tree, and a tree will treat a pruning wound as it does any other injury. Trees actually "prune" themselves in some circumstances. When lower branches become shaded and cannot produce the energy needed to survive, they are sealed off and discarded. Trees have adapted an elaborate internal system of connecting branches to the wood of the trunk that supports the branch but can seal it off when its time has come. Within this junction, called the branch collar, there is an interlocking "switching system" of vessels that supplies these functions. Arrows show what the branch collar looks like as a tree grows (left to right), Note interlocking vessels. pruner. If pruned at the right spot, the collar will be able to seal off the wound quickly. But if the collar itself is damaged, the process of compartmentalization will be impaired, and the collar will become infected and add to the stress that the tree is trying to overcome. Because the vessels split in two at the collar, cutting too close to the trunk cuts into the mainline vessel as well as the branched portion. Trees can adapt to changes in the environment, but when change occurs too quickly, they may not be able to respond fast enough. Two species, American chestnut and American elm, were driven to near extinction when people imported other species of chestnut and elm infected with diseases that indigenous trees were not adapted to resist. A journey to the center of these trees would have revealed that they were not able to compartmentalize quickly enough to fight off the unexpected foreign invaders. Our journey has shown us that trees are far more complex than what is apparent when we look out our window. We have also found that trees rely on structures and processes that no other organisms possess. Perhaps this is how they have survived all these eons and have watched dinosaurs come and go.